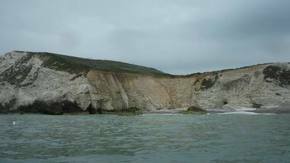 You are spoilt for choice on the Isle of Wight with a range of beaches to suit all tastes (apart from those who enjoy warm seawater obviously...). Please note, this page is a work in progress and isn't yet comprehensive - if you've got a favourite and a photo, please contact us. Beware of tides and currents when swimming - most beaches have information boards with lifesaving advice. Rules around dogs are also covered in our guide to dog friendly Isle of Wight holidays. 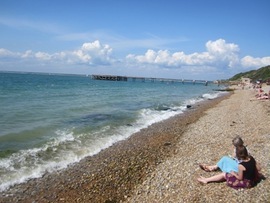 Or are you looking for the fancy Isle of Wight Best Beaches Interactive Map? Quieter section between Sandown and Shanklin. Watersports available. Accessed by steps down or by walking from Sandown or Shanklin. Cafe for those less keen on swimming. 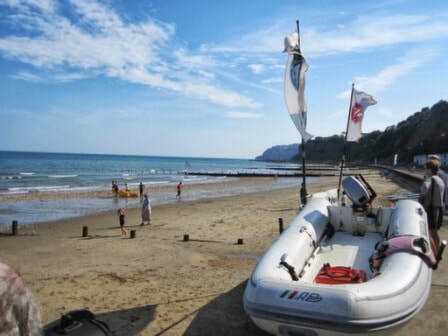 Shanklin is ideal for families looking for a bucket-and-spade-traditional-seaside-day-out. There is mini golf on the esplanade, toilets, (paid) parking, sandy beaches, bouncy castles during peak times and plenty of places to eat. There's also a lift up to the clifftop. Dog ban on the whole beach from May to September, apart from a section at the far end near Lake. 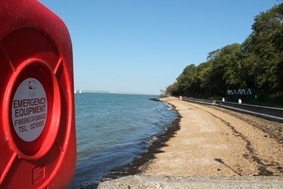 Near to family holiday parks including Landguard and Lower Hyde. Gorgeous bay with sand, attractive tree lined cliffs and enticing water for a swim. Has a nice cafe (worth checking if it is open). Access is difficult. Most people walk through Whitecliff Bay Caravan Holiday Park and then down a very very steep slope. Photo is at high tide. No dogs allowed at any time of year. Ideal for young families, offering parking, a playground, sandy beaches, toilets and a cafe. Pushchair and wheelchair friendly walk and nearby park. Not great for swimming at low tide. Popular for beach football. Summertime dog ban on the main section of beach up to the Appley Tower (the Tower is the thing in the picture), with a dog friendly section at the Seaview end. Pay and display car park, toilets and cafe. Plenty of beach, nice clifftop views. A little windswept. Near to Isle of Wight Zoo, Dinosaur Isle and playground in Sandown. Less busy than Sandown, which can be accessed via a seawall walk. No dogs allowed in summer in front of the car park, but dog friendly in the large section in front of the cliffs. Mostly sandy with large beach for games at low tide. Shallow water which is better for paddling than swimming. Basic facilities only, easy parking along the esplanade. Bit blowy and exposed. Backed by posh houses with views of Portsmouth. Dog ban on the main section of beach from May to September, there is a dog friendly bit to the left of The Boathouse pub as you look out to sea and head towards Appley. Near to ​Salterns Village Cottages. Nice outlook and accessible sea wall for wheelchairs and push chairs. Cafe selling ice creams. Nice location for a dip but very shallow at low tide. Car park gets very full so you might have to walk from the village or park in the National Trust one nearby. Near to Nodes Point Holiday Park and St Helen's Holiday Park. 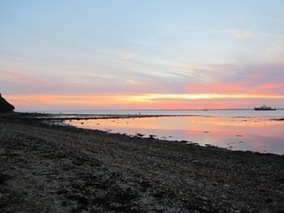 Probably the best Isle of Wight beach for rockpooling at low tide (see our tide times). Home to an impressive lifeboat station which you can visit for free. Nice cafes nearby, pay and display parking and toilets. Bit shallow for swimming usually. Dog friendly beach all year round. Nicely shaped bay backed by grand houses (in the distance in this photo). Big concrete seawall is good for pushchairs etc but not especially pretty in my view. Check tide times as there isn't any sand at high tide. Not easy to park nearby. Basic toilets. 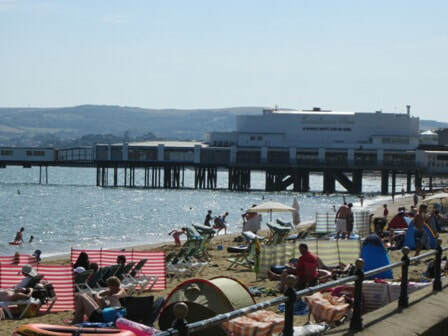 Some people swim here, others use it to access Priory Bay round to the east via the wooden walkway (shown in photo), which also has a small bit of shady beach beneath it (good for those rare scorching days when you don't want to get burnt). Chairlift down to the multi coloured sands. Boat road out to the needles. Large stones make walking difficult. Toilets in the pleasure park. Not one for swimming. Ideal for surfing, sunsets, natural cliff backdrop. There is a toilet and usually an ice cream van in the car park. No dogs (use nearby Brook Chine instead). Fantastic vistas on the Military Road between Hanover Point and Freshwater Bay. No dogs allowed in summer (May to September). 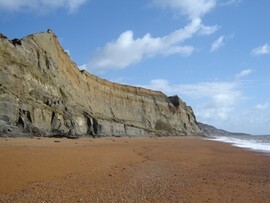 Natural cliffs, dinosaur bones (possibly...), dog walkers allowed, peace and quiet, quite a bit of surf on a choppy day. National Trust parking, no toilet (use Hanover Point). Sometimes gets busy with kite surfers which makes swimming precarious. Dog friendly all year round. Stony beach on one side, sandier patch during low tide on the other side. Car park nearby. Watersports take place from here. Big crashing waves but a few rocks to watch out for too. Never a huge amount of sand but nice for a swim with a pretty outlook and decent facilities and parking nearby. Dog friendly if you turn right at the slipway. Near to Colwell Bay Holiday Cottages. 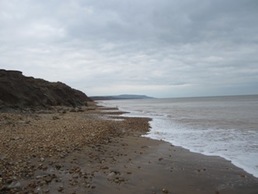 Stony beach at high tide but lovely outlook and does get sandy sections at low tide. 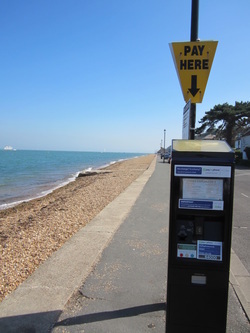 Some parking on the seafront, though it's not free any more. Bit of a long walk down otherwise. Disused pier. Reasonable toilets. Restaurant on the front. Bit stony for swimming at high tide so bring wetsuit shoes! Walk down the steps near Isle of Wight Pearl, free parking (April 2018). Mix of stones and sand. Good for a wander, crumbly cliffs, very quiet with just a few dog walkers. No facilities. Small stony beach next to Fort Victoria Country Park. Certainly not a favourite of ours but it does have parking, toilets, a cafe and a grassy area for picnics. Difficult to park nearby, but easy to walk down. Stony beach with no facilities, next door to a holiday park. Good spot for angrily throwing stones into the sea after a breakup. Try not to hit any swimmers. Shingly/sandy beach. Toilets, parking and food and drink nearby as well as a paddling pool for toddlers. Busy during high season. Decent for swimming. The place to be seen in Victorian times! Dogs not allowed in summer (May to September). As the name suggests, there is a steep slope to access (I would say that it is too steep for a wheelchair unfortunately, though we have managed to take a pram down with a bit of a struggle). Nice swimming, toilet available, nice cafe, beach gets a bit busy sometimes. Feels Cornish. Dogs only allowed on leads. 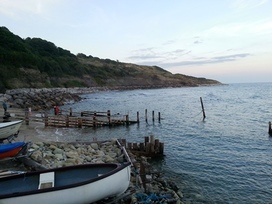 Nice wheelchair and pushchair friendly walk from Bonchurch to Ventnor, although there is a steep hill to the Shore Road car park. Tide usually right up against the sea wall with crashing waves during the winter. Not a swimming beach really. Toilets at the Bonchurch end. Near to Riviera Park (lodges and apartments). Hard to access, terrible for swimming, stony and difficult to walk on with no facilities but beautiful, isolated, peaceful, romantic. Ideal for angsty song-writing. You won't find an amusement arcade here. Rather inaccessible from the top now thanks to erosion but you can reach it by walking along from nearby beaches. Stunning high cliffs with views into nothingness and rarely another human being in sight. Ideal for hermits, anglers and angsty teenagers. Quiet beach in the back of beyond with boats and a rocky seawall. Backed by woodland. Not a lot of beach at high tide (see photo). No facilities to speak of, but it can be accessed via a fairly decent road. Also known as Castlehaven. Ideal for Queen Victoria. Lovely outlook, but you have to pay entrance to Osborne House to get in. Ice cream hut available and shuttle bus from main house. Shingly beach on the Parade with parking (if it's not too busy). OK for a quick dip, but watch out for passing cruise ships. 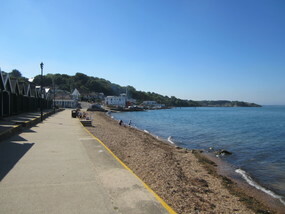 Lovely walk between Cowes and Gurnard and some interesting properties to gawp at on the Parade. No dogs allowed in summer (May to September). See our guide to places to stay in Cowes. Pretty beach huts, cafe and pub nearby, some parking available, OK for a quick swim, nice sunsets and mainland views. Not a huge beach even at low tide. Don't swim out too far unless you fancy shopping in France. No dogs allowed in summer (May to September). 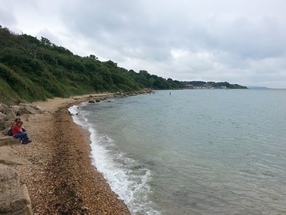 Gurnard's other beach is sort of hidden as it backs on to woodland and is accessed down a footpath called Shore Path behind Gurnard Sailing Club. Shingly beach with only a little bit of space, but nice and quiet usually for watching the sunset. No facilities. Accessible via Thorness Bay caravan park. 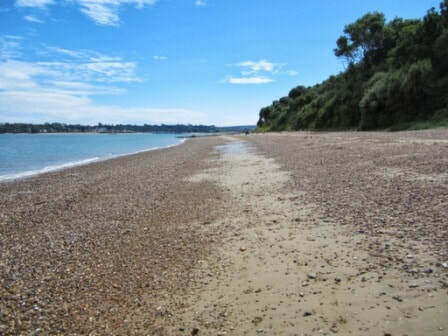 Scrubby beach with a mix of sand and stones, lovely sunsets, backed by woodland and farmland. Popular with anglers. Scrubby beach overlooking a busy shipping area. Wouldn't fancy swimming here. Big playground on the Esplanade with a paddling pool, toilets and cafe. Some free onstreet parking (2015). Can be a bit smelly if the wind is blowing the wrong direction. No dogs allowed from May to September. 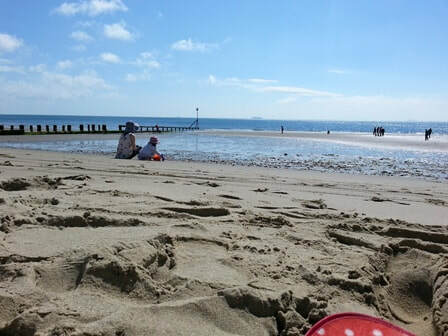 The-Isle-of-Wight-Guru-Don't-Blame-Us-Disclaimer™ The information on this website is correct, as far as we know, but please do check opening times of beachside cafes and other attractions if you are planning a long journey - and please contact us if you find anything inaccurate.